Michael Devlin, 41, was charged with kidnapping after Ben Ownby, 13, who vanished earlier this week, and Shawn Hornbeck, now 15, were discovered. His flat near St Louis was searched after police noticed Mr Devlin's white van matched the description of one seen when Ben vanished near his school bus. 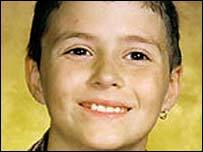 Shawn Hornbeck went missing from a rural part of Missouri in October 2002. A police sheriff in the Kirkwood, a city near St Louis, said both boys appeared unharmed. Mr Devlin - manager of a pizza shop and a part-time funeral home worker - was initially charged with one count of kidnapping, but more charges were possible, the sheriff added. In the St Louis area, there has been unreserved joy at the news that both boys had been found safe. Ben Ownby's disappearance on Tuesday had sparked a major hunt in the area around his home. Prayer vigils were held and "missing" posters were fixed to walls around town. 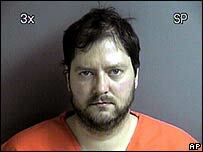 But police out hunting for Ben Ownby were not expecting to find Shawn Hornbeck alongside him. Shawn was just 11 when he failed to return home after going for a bike ride near his home in Washington County, some 60 miles (100km) from St Louis. His parents, dozens of volunteers and sniffer dogs searched for weeks to no avail. In the years after their son went missing, Shawn's parents, Pam and Craig Akers, devoted themselves to missing child cases. Craig Akers left his job to devote his time to a foundation bearing his son's name. They used up their savings, borrowed money and talked to psychics, until the financial strain forced them back to work, the Associated Press reported. On the anniversary of the disappearance in October, Pam Akers said: "It's been four years. But for me, it's just been one long continuous day." Gary Toelke, a local sheriff said officers had been "just on cloud nine" since the discovery of the boys. "The last four days the things that we've gone through... you know you have to face the family everyday, tell them what we have if we've had any luck yet, you know that wears on you and to have something like this happen there's nothing to describe it. "But you know the main thing is what the family has gone through. I know how we felt, I can image how they felt. That's their child and it's got to be an unbelievable feeling for them too." The St Louis Post-Dispatch newspaper reported that when the manager of a St Charles supermarket announced over the store's PA system that the boys had been found, shoppers stopped in the aisles, clapped each other on the back, hooted and applauded. Lisa Williams, who leads Ben Ownby's Boy Scout troop, told the paper: "We were all excited and amazed. It's unbelievable. We are so glad to have Ben back." The authorities say they are still investigating the motive behind the abductions and have released no information on the conditions in which the boys were held.